School trips: We love to host school groups at Gattitown! With seating for hundreds, we can accommodate large and small groups. We are the perfect destination for a reward trip, or come before or after another activity! 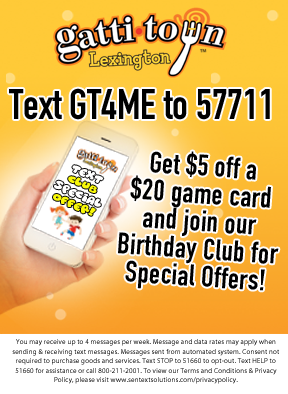 Call us today at 859-559-4226 for group pricing on buffet or buffet/game card packages or click here to contact us. Educational Field Trips: LEARN, EAT & PLAY! Field trips are easy, fun and affordable with lessons, based on Common Core Content taught by certified teachers from 10am - 11am, before we open to the public. Lessons are followed by our award-winning pizza, pasta, salad, dessert and drink lunch buffet and then play in our HUGE Midway with arcade games, carousel, bumper cars and more! There is a 50 student minimum and a 140 student maximum for Educational Field Trip packages. NUTRITION K-5: Students learn about healthy food options and fill their "plate" with items from Gatttown's menu. Includes a kitchen tour and classroom activity. WRITING (sequencing) K-5: During a kitchen tour, students learn our step-by-step method of pizza-making and then complete an activity including a how-to writing piece. FRACTIONS 1ST-5TH: To reinforce what students are learning at school, our teaching team uses fractions in games and activities. ECONOMICS (wants versus needs) K-5: Students "shop" for their needs and wants while making decisions about savings and spending. Kitchen tour optional. ECONOMICS (Build Your Own Business) 4th-8th: Students learn about natural, capital and human resources while creating their own business plan for a start-up pizza restaurant. Includes kitchen tour.